A food distributor's need for flexible costing and pricing options are included and exceeded with entrée. For example, whenever there are changes to an item's cost (most commonly during the process of receiving inventory via a purchase order); you will be quickly and easily guided through the process of updating your costs and pricing. Tracking your costs properly while having your customers pricing updated automatically is of critical importance. It allows you to provide accurate gross profit information while maintaining the profitability of your operation. 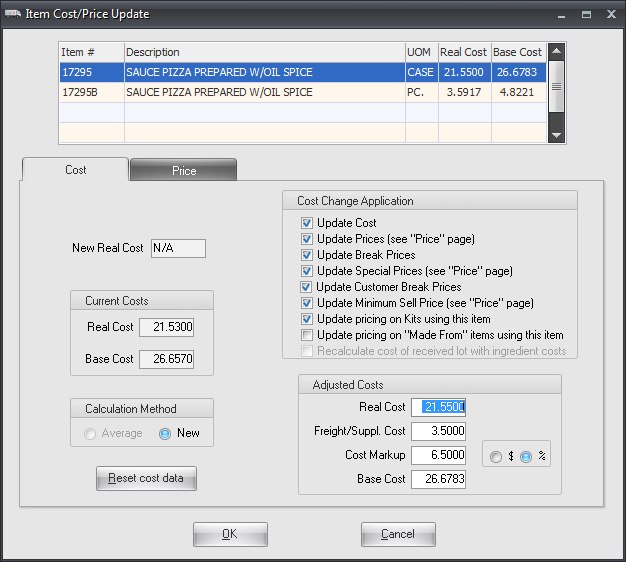 Once you define the rules, entrée can update the cost and price data throughout your system in seconds. When a cost or price update is triggered, entrée will provide you with an update screen which already knows all the rules defined related to how you want this data updated and propagated throughout your system. It can automatically update the cost and pricing of directly related items, such as PC, LB, HALF or QRTR items pulled from a CASE. The entrée system allows you to define up to 99 Price Levels per item. Customers are then assigned to a specific price level. Each price levels can be determined off the Real, Landed, Base or Market Cost. Levels can be defined to be calculated off a dollar float, a "% of Cost" or "% of Sell Price" formula. Price rounding is supported to the nearest penny, nickel, dime or quarter. The Cost Mark-Up field in Inventory File Maintenance allows distributors to add an overhead or burden factor to the cost of an item. 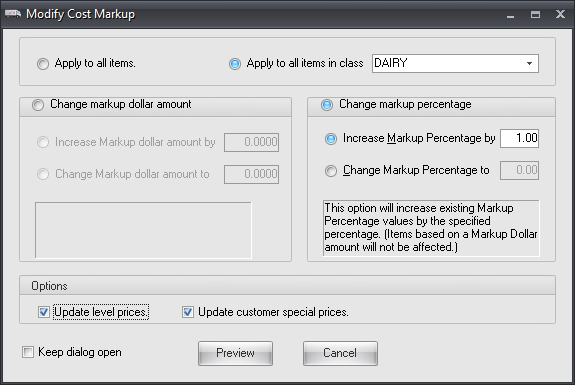 The Modify Cost Markup Utility has been developed to allow your business to quickly and easily react to economic factors impacting your costs. You can perform large scale updates of the Cost Mark-Up field value by a specific dollar amount or by percentage and select all the items in your inventory for update or select items by class. Options are provided to recalculate Level Pricing and Customer Special Prices. The Preview feature shows a list of the items and the associated changes for you to review before initiating the actual price updates. Customer Special Pricing is a powerful pricing feature utilized by many food distributors using entrée. You can literally define a special price for every item that each of your customers may purchase. These special prices can float dynamically as your costs change by either a dollar amount or a percentage. One of the key features is the ability to define special prices that are calculated as a percentage or dollar amount over the Real, Landed, Base or Market Cost. Editing of Special Pricing can be accomplished either by customer or by item. For example, if editing by item, all of the customers which purchase that item will be displayed at once. When editing by customer, you will see all of the products that customer normally purchases along with their assigned special price for each. 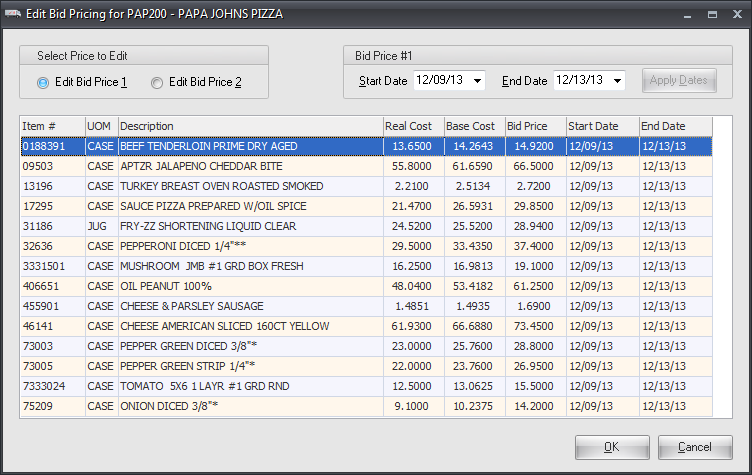 You can also define Bid / Contract Pricing for your customers from within entrée. 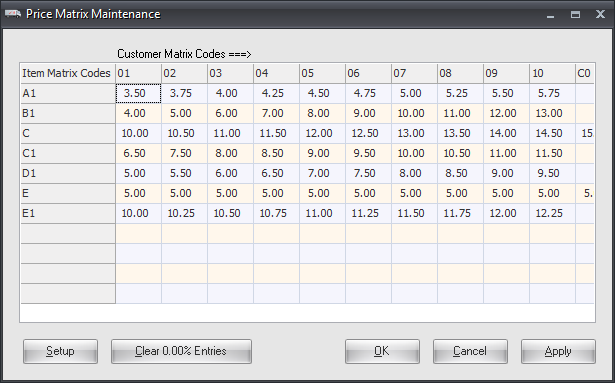 This is special pricing providing a locked in price for a customer within a defined date range. This special pricing will not fluctuate regardless if your costs go up or down. If the delivery date of a customer's invoice falls within the terms of the Bid / Contract Pricing, then that pricing will override other pricing methods. 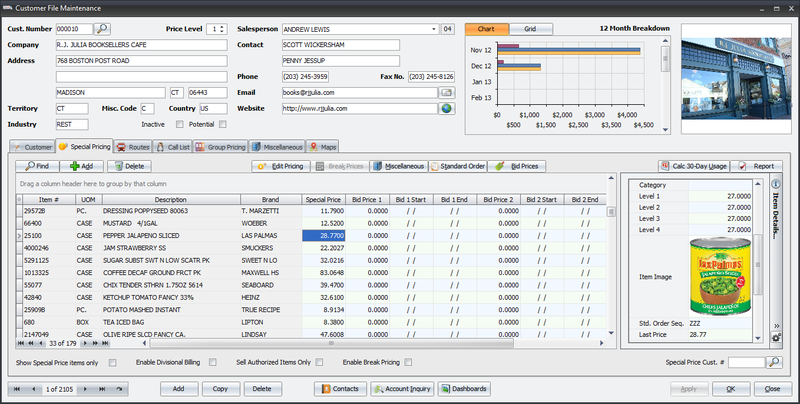 You can define two sets of Bid / Contract Pricing per item per customer. 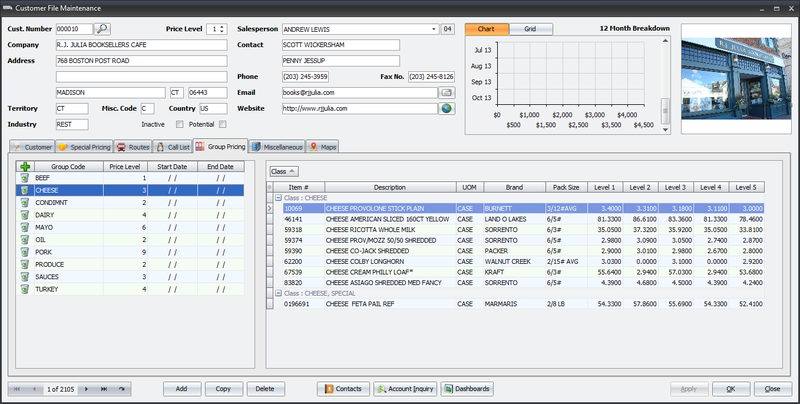 The Break Pricing feature in entrée allows setting up quantity price breaks on a per item basis. This allows you to encourage customers to purchase more, as the higher quantity they purchase, the lower pricing they can receive. For example, if you allow your customers to place their own orders online, via our entrée.NET system, they will see the Break Pricing for the item being ordered so they can take advantage of savings by purchasing a larger quantity. The feature provides starting and ending dates (both dates optional), an option to control whether the Break Price will override a Customer Special Price and an option to determine whether or not the prices will be updated to follow changes in the cost of items. 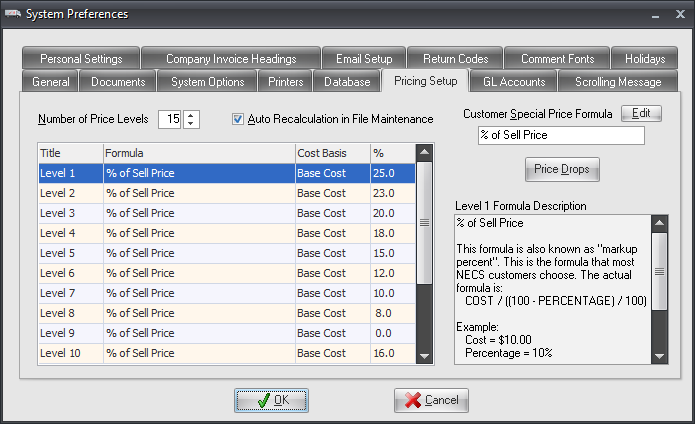 Note that you can selectively edit via the Customer file, which customers qualify for Break Pricing. You can define item or class based sales promotions in entrée to provide savings to all or a specific group of customers. Promotions can be based on a dollar or percent as well as "Buy X get Y Free" concept. 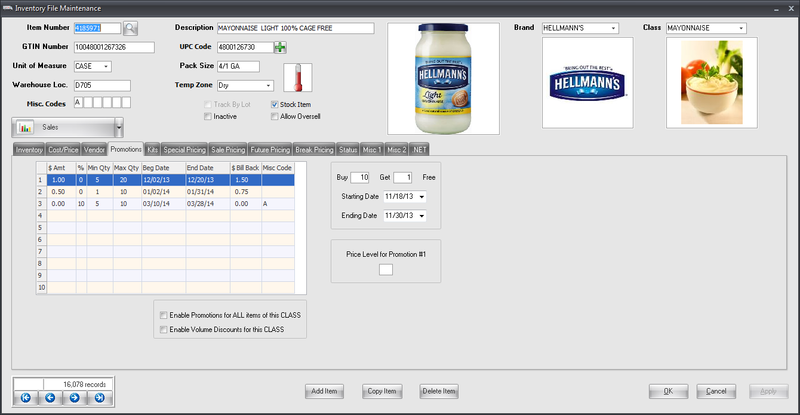 Whether or not an item qualifies for a promotion can be determined by setting a minimum and maximum quantity, as well as a date range. Some distributors use the minimum and maximum quantity restrictions to set quantity pricing breakpoints. For example, if a customer buys up to 5 cases of the product they would get the promotion rate of $1.00 per case off. If the same customer bought 6 to 10 cases of the product they would receive $1.25 per case off, etc. Bill Back dollars can also be defined to track vendor rebates/bill backs. One of the notable pricing features of the entrée system is the ability to maintain an item's Sale Pricing. Sale Pricing can be enabled via a starting and ending date. You can also selectively choose which Price Level assignments will quality for Sale Pricing as well as specific customer groups which qualify. For example, you can define that an item's Sale Pricing is only valid for customers that are assigned 'Price Level 1' for their purchases and that are designated as "Retail". Sale Pricing can be used to maintain weekly specials, coinciding with advertising and/or flyers you send to your existing or potential customers. 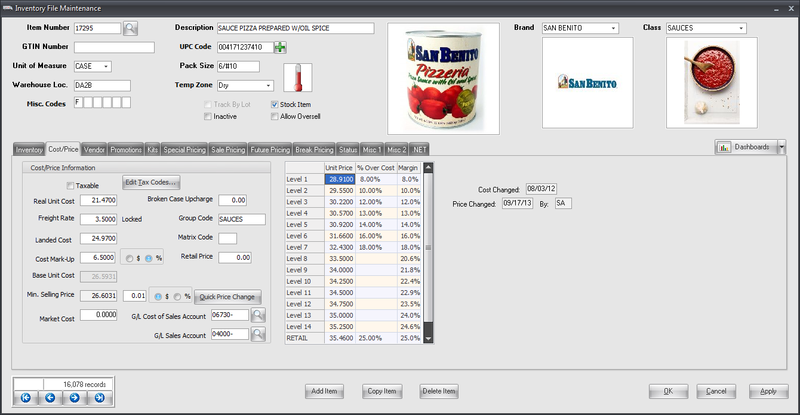 Group Code Pricing is yet another feature the entrée system offers to provide more flexibility with your pricing. A Group Code is an eight character field which represents a general class of items. For example, MEAT, CHEESE, SEAFOOD, PRODUCE, BEEF, POULTRY, etc. can all be valid Group Codes. Group Codes can also be assigned effective dates, so this feature can only be active for the date range you enter, if you prefer. You assign a Group Code to each of your items. You also assign a Price Level to each of your customers. 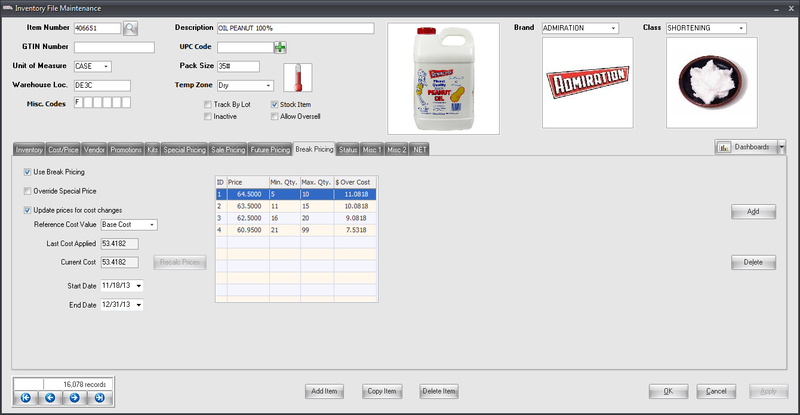 Then using the Group Code feature, you can override the customers normal Price Level, depending on the type of item purchased. 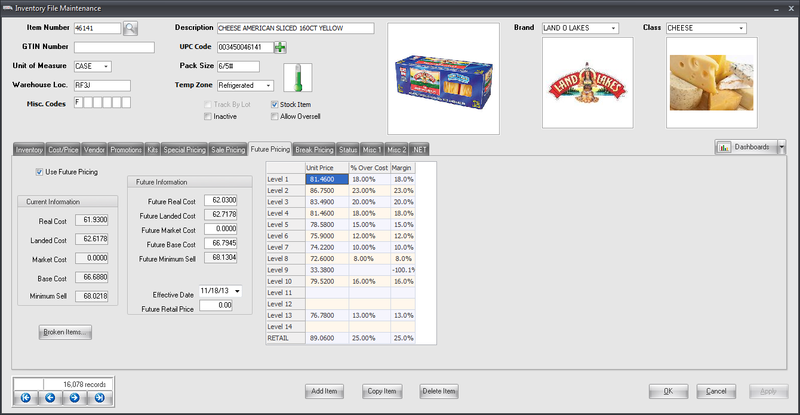 For example, if a customers is assigned to "Price Level 2", but they purchase an item assigned to the CHEESE Group Code, which you set to "Price Level 5" Group Code Pricing for them, then they will receive "Price Level 5" pricing automatically. The struggle to keep pricing up-to-date is a never-ending battle for food distributors carrying tens of thousands of items. As costs fluctuate, pricing must be adjusted properly to preserve your margins. A simple yet flexible approach that some entrée users utilize is based on Price Matrix Codes. A Matrix Code is assigned to each item and each customer. When defining your Price Matrix Codes in entrée and assigning Cost Markup Percents in the grid, it can be compared to a road map. When matrix pricing is calculated, the entrée system will look at the customer's matrix code and the matrix code of the item being purchased. Where those two codes intersect on the grid represents the proper Cost Markup Percent. The entrée system takes the current Base Cost of the item, adds the Markup Percent, and then calculates the correct price. 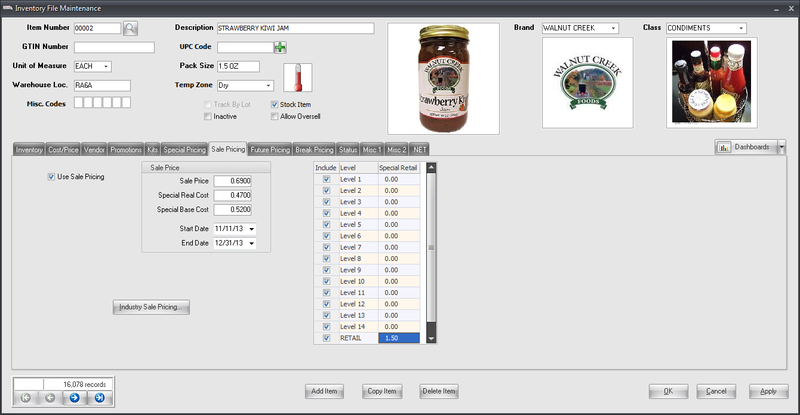 The Price Drops feature was created for food distributors dealing in commodity type items, which may tend to fluctuate in price because of market shortages, etc. If the cost of a commodity item rises too quickly, you may choose to lower your Cost Markup Percent so that your customers do not pay an excessive price for the item. Later, when the cost of the item stabilizes, entrée can automatically readjust your pricing back to normal. When Price Drops are defined and an item's cost changes, entrée will determine the proper Cost Markup Percent when calculating Price Levels using the formula: Cost Markup Percent - (minus) Price Drop Percent. A negative Price Drop can be used to increase the Cost Markup Percent of a Level Price when costs fall back to normal levels. Many foodservice distributors update their pricing on a periodic basis, usually one week at a time. Pricing stays constant for the week. However, many times, next week's pricing is known as early as Wednesday of the previous week. The Future Pricing option was created to address this situation. The entrée system allows you to enter cost and pricing for specific items that will go into effect on the date you specify. In essence, this pricing information sits in a holding file until it is rolled over, or updated by you. In addition, prior to the effective date, different parts of entrée (such as Price Lists, Customer Order Forms, Invoices, etc.) can use the future pricing.